Moving on before I break down in tears, I thought it's time I shared my last Memebox of the year as I did receive it a week or two ago. This is the Mission Possible: Long-Lasting Superbox, which means all products received are full sized ones. "This long-lasting Jelly Lip Tint delivers intense color with no sticky residue. It provides buildable coverage for a natural, sophisticated, or glamorous look. The weightless formula leaves lips stained, soft, hydrated, and refreshed upon application. How to use: Apply directly to lips." I really need to go out of my comfort zone and try some red/brighter lip products. I seem to have accumulated quite a number of red lip products from beauty subscription boxes that I have yet to use because I prefer natural pink shades. "A creamy-textured primer to be applied before eye makeup application to increase pigment adherence and lasting power, and to mattify and smooth out skin texture. Suitable for all skin types especially for sensitive skin. How to use: Gently dab over your lids and blend it in." As I do have a fair few eye primers and rarely use eyeshadow, I will most likely be giving this away to someone who would appreciate this more and use it. 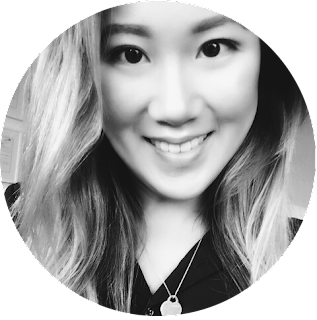 "No more smudged panda eyes! Coat over eye makeup with this Luxe Eye Fixer to set it in completely for a forever lasting finish. Its gentle formula of honey extracts, Vitamin E, and collagen is non-irritating on the sensitive eye areas. How to use: Apply the fixer over eye makeup. For removal, simply peel off the now coated pigment from your eyelids." I'm not sure about this product. Whilst it's unique in the sense that I've never heard of a product such as this, I'm not sure I even want to try. The "peel off" property of this product has got me questioning the ingredients in this "eye fixer". I don't think peeling off products from your lids is good for the elasticity of the skin in such a sensitive area. "A long-lasting, fast drying liquid eyeliner that delivers precise contouring and a flawlessly clean line. The smoothly applying liquid formula and the tapered brush allows just the right amount of ink on the lids, guaranteeing an even line in just one stroke. How to use: Use the attached brush to draw in the eye line, controlling the thickness to your liking." One can never have enough eyeliners. The majority of my eyeliner collection is black, so I could do with another brown one for days where I want a more natural look. "A lightweight, non-sticky weapon for longer lasting makeup. The Oh! Shy Real Topcoat Fixer creates a sweat-proof, rub-resistant barrier for fresh-looking makeup that lasts up to 12 hours. Its blend of honey and hyaluronic acid also increases hydration for a silky, smooth appearance and won't dry skin out. How to use: Evenly spray over makeup as a sealing topcoat." I'm not going to lie, when I read "Topcoat" I automatically thought it was a nail polish. I was a tat disappointed when I learnt it was not a nail polish. As mentioned a few posts ago, that I rarely do use a makeup setter as I do not have a problem with my makeup not lasting through the day. Not quite sure what I'd do with this fixer yet, I may give it away as well. "Formulated with organic green tea extracts and moisture polymer, this is a hydrating hair lotion essence which not only deeply nourishes damaged ends but also works to style and set your curls for a lasting volume and gloss. How to use: Blow dry first and then style the hair with this essence. It's especially suitable for curly hair." This product makes me want to curl my hair! I try not to use any heat on my hair, as it is really damaged from the bleach it's been exposed to. So I'm not sure when I'll use this. Maybe for Christmas? 7. Original Raw Perfect No Sebum Powder SPF45 PA+++ - 10g (RRP: $16) "This luxurious translucent finishing powder sets makeup and slightly mattifies the skin without caking and without changing the skin's natural tone. Made with corn powder, rice, black beans, and blackberry, this multi-functional powder provides SPF protection, controls excretion of excess sebum, and softens the appearance of imperfections, fine lines, and pores. Wear it alone or over makeup for a long-lasting makeup stay. One universal shade works for all skin tones to gift a soft lit glow! How to use: Apply using the included powder puff for a silky finish to makeup or for a quick fix-up." Yay! A product I'd actually use! I use a powder to set my foundation all the time, so this will definitely be used! That's it for my last Memebox of the year. I don't know if there will be another Memebox post for a while, as there hasn't really been any new boxes released that I fancy. Also, I'm starting to realise that there has been an increasing amount of products included in beauty subscription boxes such as this that I wouldn't use or have a surplus of. Anyone else feel the same way or is it just me? P.S. 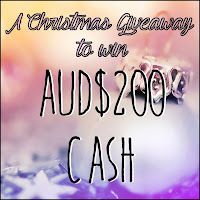 Have you entered to win AUD$200? Click the image below for more information to enter!